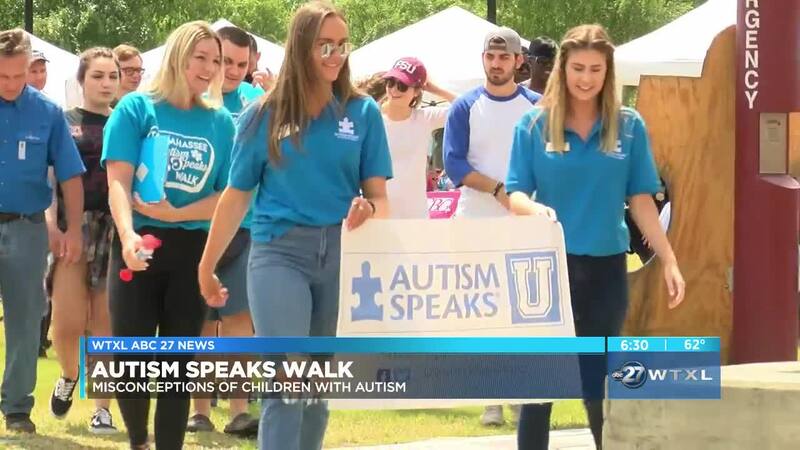 April 1st is the the start of Autism Awareness Month, but on Sunday people in Tallahassee came together a day early to bring awareness to the disorder. Over 100 people participated in the walk that started on Langford Green and circled Doak Campbell Stadium. According to a CDC study in 2018, 1 in every 59 people born in the world is diagnosed with autism. That number is a sharp increase from just 7 years ago, when it was 1 in every 88 children. One father of a child with autism says it's great the community is bringing awareness to the disorder. Stephen Paulhus and his wife wanted to participate in the walk after recently finding out their son Troy is on the autism spectrum. For the Paulhus family, as well as, others who have a child with autism feel some people have misconception about autism. "People assume people with autism aren't capable, sometimes they assume that people with autism are different and truthfully people with autism are just people." said Kyleigh Eaton and organizer for the walk. According to Eaton, the walk raised about $5,500.